This is what local looks like on vacation. These lobster rolls must be eaten on a picnic table next to the beach. I’m sure it would be! Did you know that the lobsters we have here in California have NO CLAWS!?? What’s the point of that?? No claws? Appalling! Both for the lobsters and for my culinary sensibilities. Claws are my hands down favorite (very bad pun intended). Aw man. What I wouldn’t give to get my claws on that! My claws snagged two of these in one sitting. So yes, things are going most excellently. I cannot wait to show you my slap bracelet shots. I think you’ll be pleased, Master Chipmunk. Lobster is the cheapest it has been in years. $3.59 a pound is cheaper than ground beef in our Maine market. $3.59 a pound? Amazing! I haven’t been to Maine in a long time; I need to take a trip I think. Connoly’s Lobster in New Brunswick used to have the largest Lobster pound in the world (not anymore though). 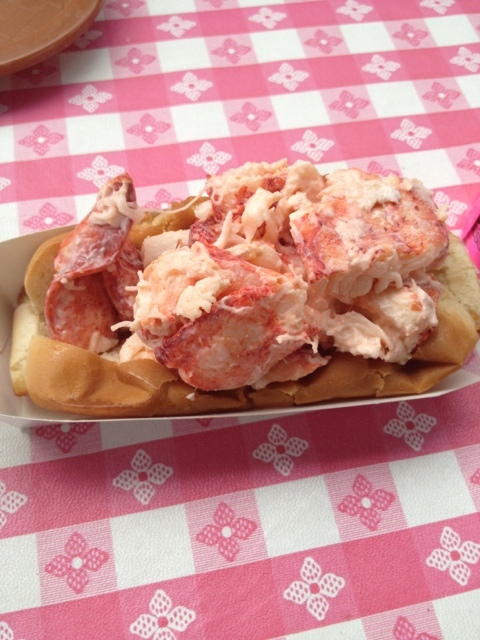 Their restaurant also used to serve a lobster roll with humungous chunks in it like your photo…. God, were they good! This lobster roll was the best I’ve ever had. And being from New England, I’ve tried a lot! 🙂 Thanks for stopping by!